My son really likes geology, and has a decent collection of rocks, minerals and gems. I drew some of them in his book (the “book of his things”), but some of them we couldn’t remember the names of. He does have a little guide but I couldn’t be bothered looking them up. I obviously really love the first one because it looks like the Crystal Shard from one of my favourite movies, the Dark Crystal. Fun drawing. I love that you catalogue your son’s childhood interests in this way. 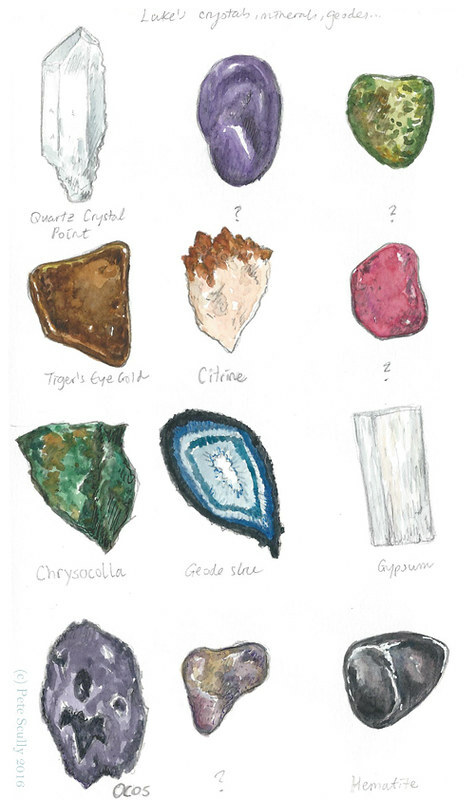 I have a ten year old son who also loves shiny rocks and semi-precious stones but he isn’t into geology as such. He just likes nature’s bling. Strangely enough we had a quartz shard that looked just like the dark crystal too but it got lost in our transatlantic move (though it may yet turn up somewhere odd). Bound to be a Rose Quartz in there somewhere. They are the coffee chocolates of the gem stone world!